I discovered this adorable new storybook, The Very Stuffed Turkey by Katharine Kenah (affiliate). 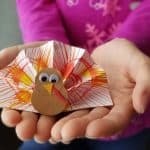 It’s about a little turkey who goes visits five homes on Thanksgiving. Along the way, he encounters various traditions, and of course, eats too much. 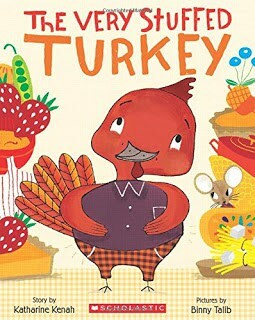 My turkey doesn’t look anything like illustrator Binny Talb’s lovable bird. 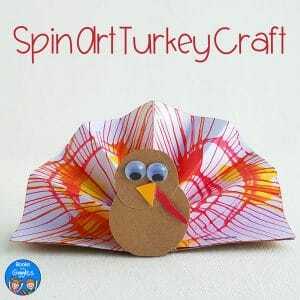 Still, I think doing a turkey craft after reading the story is a fair pairing. 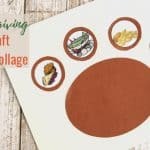 While you craft, you can talk about your own family’s traditions and holiday plans. 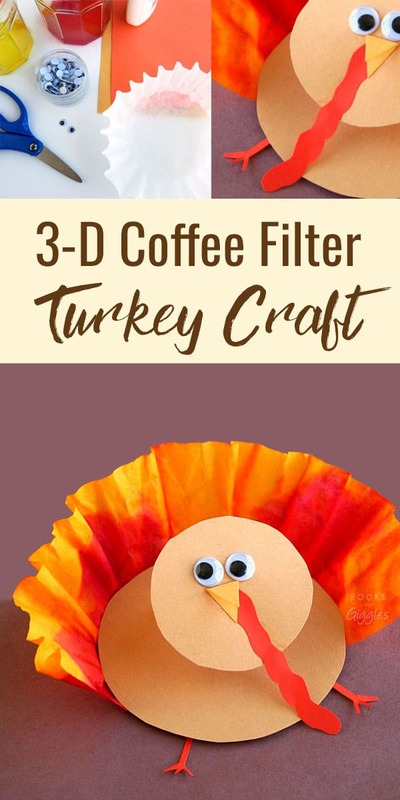 There are a lot of different coffee filter turkeys on Pinterest, so I don’t know for sure if that’s what inspired me to make this one. 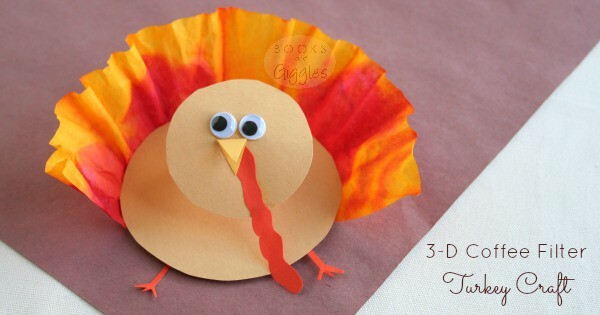 More likely, I saw these watercolor turkey crafts on Playdough & Popsicles. They’re quite different than what I ended up with, but would be great for toddlers or younger preschoolers. 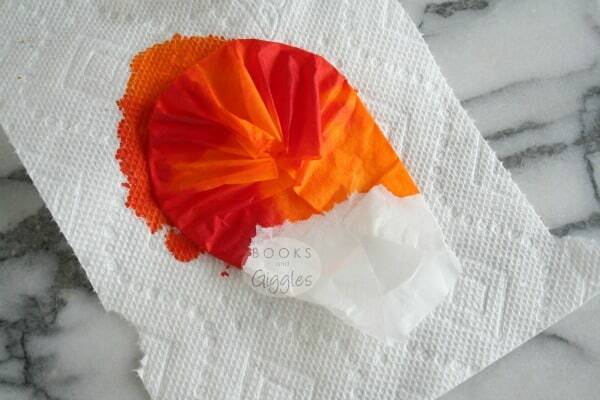 The trick to getting the filter to hold its shape is painting it while it’s folded. You fold it into itself and tape it, like shown below. It’s kind of fiddly to do, but not hard. Try not to worry about making it perfect. Set the folded filter on a paper towel or two. Next, drop the liquid watercolor or food coloring onto the filter. Then let it dry undisturbed. Meanwhile, cut out all the turkey body pieces. 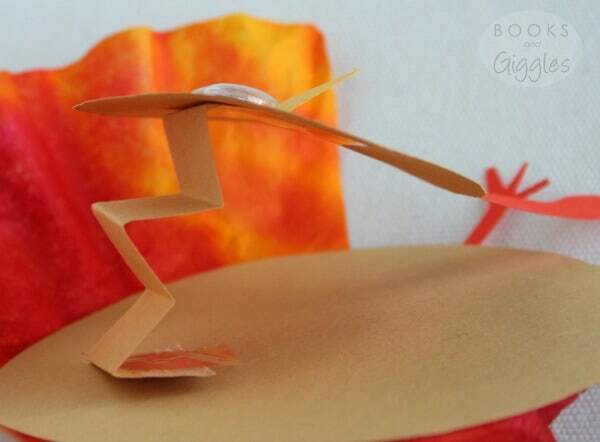 To attach the head to the body, accordion-fold a strip of paper. Then tape it to both sides. Here’s a side-view closeup. 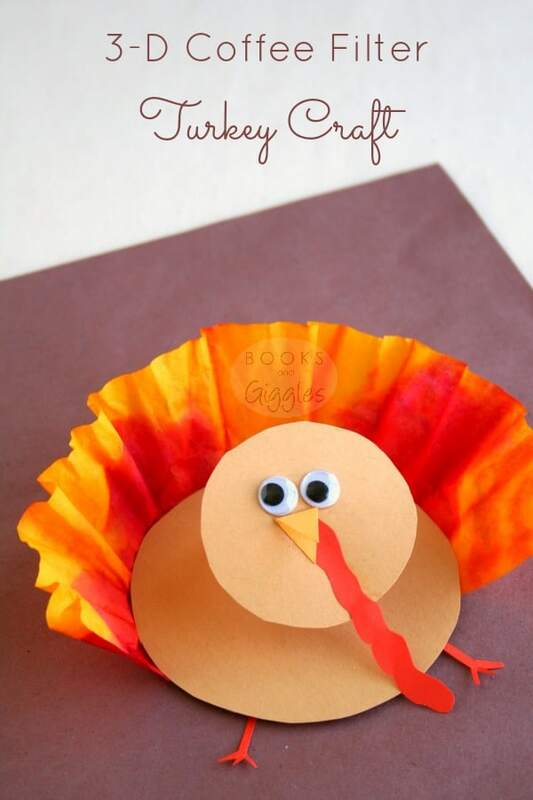 When your filter is totally dry, open it up and cut off the bottom so that the turkey body nestles in as shown. Glue it in. 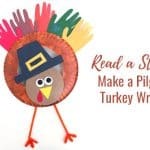 You’re ready to gobble gobble! 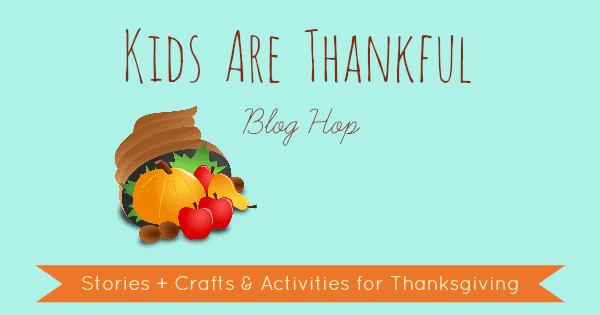 This post is part of the Kids Are Thankful blog hop. 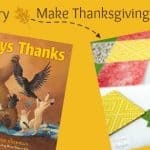 Several other bloggers and I have teamed up to share Thanksgiving-themed storybooks with related crafts and activities. Go see which one is your favorite! I love that is is 3D! The watercolor coffee filters turned out great. I love how bright and colorful they are! So cute – Thanks for linking up to Pin Worthy Wednesday, I have pinned your post to the Pin Worthy Wednesday Pinterest Board. We don't have coffee filters in the house, but we love dying crafts. I think I should buy coffee filters just for playing with colors. I love how vibrant the reds and yellows came out. 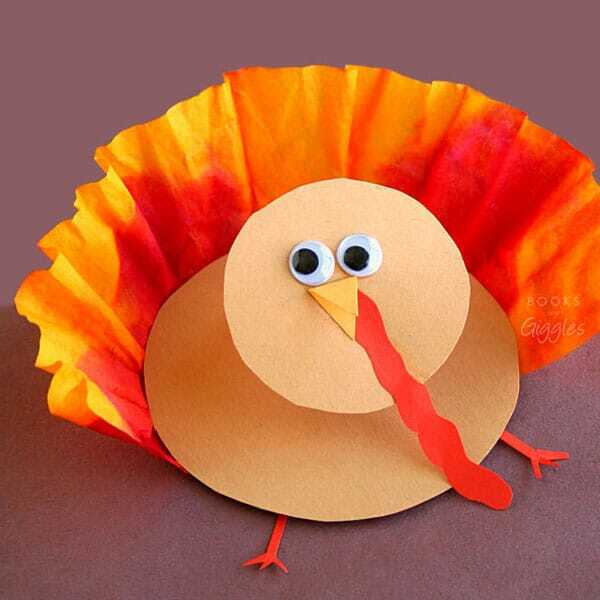 Very cute turkey! This is so darn cute. Looking forward to trying it with my 3’s. I really like the 3D effect and thank you for the advice on how to keep it from going flat . Your colors are vibrant and really pretty. You’re welcome! 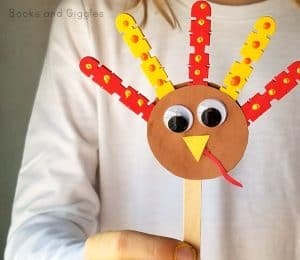 It was a really fun Thanksgiving craft to create. I hope you enjoy it too! I want to do these with my K class. They are very cute! I did a sample at home and am not sure I have the technique down for the coffee filter. First, you say to paint on the color. Then you say to drop on the color. Which did you do? Also, mine seemed to take a lot of food color. Am I doing something wrong? Thanks! We made our turkeys with regular cheap grocery store food coloring on a 4-cup filter, and it didn’t seem to use that much. However, if I were doing it in a classroom setting, I’d probably experiment with washable liquid watercolor paint, homemade liquid watercolors (from old markers), or just painting with watercolor. Also, I’d pre-fold and tape all the filters for the kids. Good luck and have fun! Thanks! I’ll see what I can do. ?